Once upon a time, there was a Hare who ridiculed a slow-moving Tortoise. 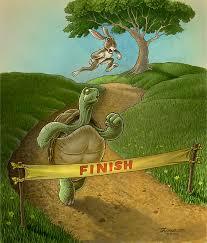 Tired of the Hare’s boastful behaviour, the Tortoise challenged the Hare to a race. The Hare soon leaves the tortoise behind and, confident of winning, takes a nap midway through the race. When he awakes, the Hare finds that his competitor, crawling slowly but steadily, has arrived before him. Is it that persistence beats hubris? Is it a metaphor for the wisdom of age in that “the old slow Tortoise” beats “the young flashy Hare”? Is it that “the more haste, the less speed” (Samuel Croxall) or “the race is not to the swift” (Ecclesiastes 9.11)? Is it the Tortoise’s plucky conduct in taking on a bully or the Hare’s foolish over-confidence (Classical Literature)? Is it that “many people have good natural abilities which are ruined by idleness; on the other hand, sobriety, zeal and perseverance can prevail over indolence” (Old Greek Literature)? Is it that the Tortoise – a thoughtful craftsman – is prostrate under the foot of the Hare – a capitalist entrepreneur (Charles H. Bennett, 1857)? Or is it that the Hare realises the stupidity of the challenge and refuses to proceed any further, while the obstinate Tortoise continues to the finishing line and is proclaimed the swiftest (Lord Dunsany, 1915)? According to Lord Dunsany, the reason that the last lesson is not widely taught is that very few of those that witnessed the race survived the great forest-fire that happened shortly after. Some time after the race, the Hare, the Tortoise and few other forest creatures saw the fire from a long way off from the top of a hill at the edge of the forest, and they hurriedly called a meeting to decide which messenger they should send to warn the other forest creatures. They sent the Tortoise! The first version of this story came out in Aesop’s Fables. A later version of the story in La Fontaine’s Fables, while more long-winded, differs hardly at all from that of Aesop. The data has largely come from wikipedia.